Have you ever had a green smoothie? I always expect green smoothies to taste gross (they’re green not from food coloring but from spinach, kale, or some other leafy greens), but they surprise me every time by being as sweet and fruity as any other juice smoothie. Aside from the color, you’d never know there were greens in a green smoothie. 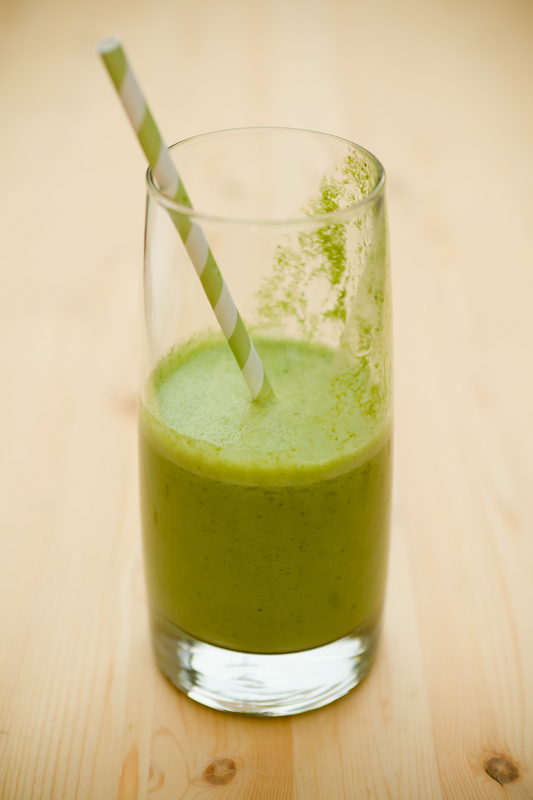 Many people use green smoothies to get their children (or spouses) to eat their veggies. Could I similarly hide some spinach in my cupcakes in a way that no one would notice? I had to find out. When Jonathan and I were out in our yard taking cupcake photos, the kids next door stopped by and begged for some cupcakes. They don’t yet know enough about my experiments to ask whether they are eating normal vanilla cupcakes or something like Buffalo Chicken cupcakes, fig, goat cheese, and onion cupcakes, or cupcakes that contain spinach. They just assumed (and why wouldn’t they?) that all cupcakes are sugary and kid-friendly. The innocent children squealed with delight as they inhaled the green cupcakes, thanked me, and told me how good they were. Green smoothie cupcakes use green smoothie as an ingredient in both the cupcake and the buttercream frosting. 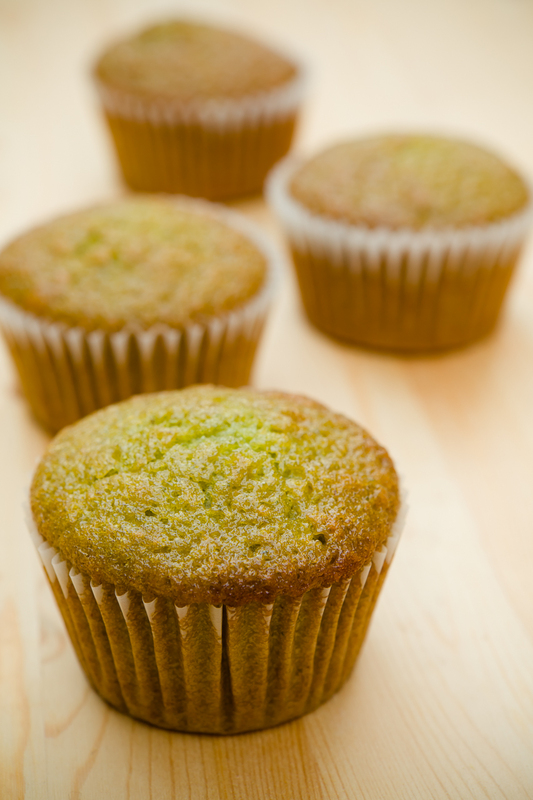 The green smoothie gives the cupcakes a mildly fruity flavor and a slightly denser than average texture. The green smoothie cupcakes are a simple one bowl recipe – the only catch being that you have to make a smoothie before you get started. I can vouch for the smoothie recipe below (both as a smoothie you’ll want to drink and as something that works well in the cupcakes), but I suspect that any smoothie recipe that you like would also work – just don’t add ice to the smoothie. Green smoothie cupcakes use green smoothie as an ingredient in both the cupcake and the buttercream frosting. 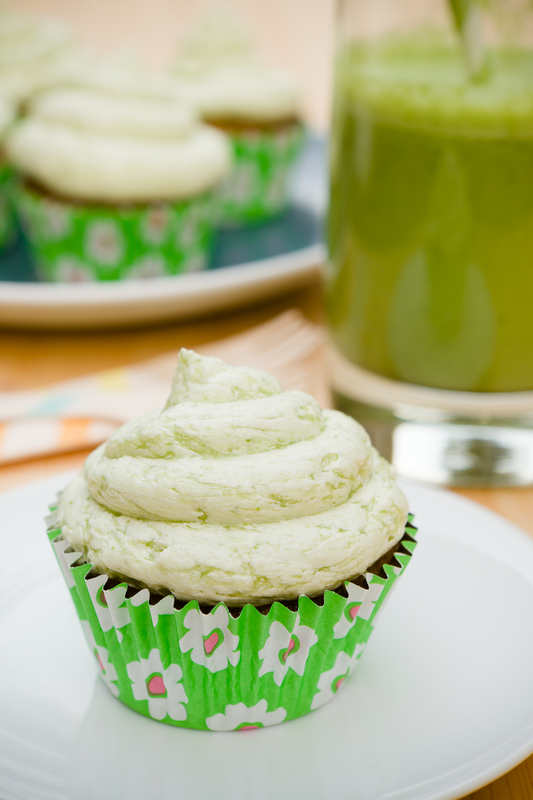 The green smoothie gives the cupcakes a mildly fruity flavor and a slightly denser than average texture. Put all ingredients in a blender (I use a Vitamix, which does an amazing job at turning spinach to liquid) and blend until smooth. In a medium-sized mixing bowl, whisk together cake flour, baking powder, and baking soda. Mix in sugar and honey. Mix in oil and smoothie until fully combined. In a medium-sized mixing bowl, mix butter and powdered sugar for about three minutes on high speed. Mix in the green smoothie a little bit at a time. I imagine that any smoothie recipe sans ice would work in these cupcakes. However, I haven't tried them all and I can only vouch for the one I provide below. My green smoothie recipe yields much more smoothie than you will need for the cupcakes. Go ahead and drink the extra smoothie while you are working. What a great idea!! My husband has a green smoothie every morning, sometimes it is the only vegetables he eats all day. Haha, what a good way to trick kids into eating veggies. What a creative idea! I love green smoothies, and I love my Vita-Mix! Doesn’t all that fat and sugar negate the healthy benefits of green smoothie? I agree that if you’re looking for something super-healthy it would be best to combine the vegetables with other kinds of food that are also healthy, but adding greens to something not-so-healthy you were already going to eat is a good idea. The point here is not to substitute, say, a green smoothie with a green smoothie cupcake, but make it instead of another cupcake that doesn’t include vegetables! I’m so jealous of you for making this. I have been pondering for months now on the idea of a green monster muffin or cupcake. They look great! AMAZING!!! I am sharing this with everyone I know!!!! Will reducing the sugar/honey in this hurt the cupcake in any way? I don’t like super-sweet desserts and I figure that the smoothie is already sweet from the fruit so reducing the added sweeteners might be good. These look awesome. I’ve made spinach cupcakes before but, I can’t wait to try these. But, I can’t have any fat. What would make a good substitute for the oil in this recipe?